Sinterklaas is a dutch event like Christmas, we make in my family a surprise for another familymember. This year I had to make a surprise for my Bro Wouter, he wants to buy a Neilpryde H2 8.2. First I thought to make something like BBC2 (he is a bigtime topgear fan), however making something like the BBC2 logo is boring!!! 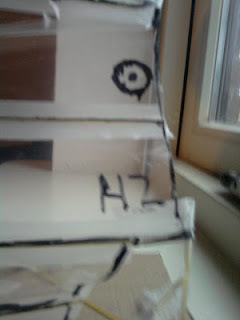 I didn't had much time but this is what I made::: From the loots R&D factory the new miniature H2 made within 60minutes. 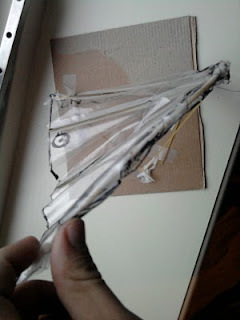 I think when taking more time than 1 hour it should be possible to make a much nicer miniature sail. Spagetti isn't ideal.... but after 5min trying with glasfiber I thought this wouldn't work on short term. Now I understand how to make a good profile, AOA of the profile and forgivingness. Its DAMN hard, and the bendcurve of the mast is very very veerrrry VERY important. My spagetti mast didn't had a really good curve ;), it sadly broke short after presenting it. Also Spagetti is not a very good material for battens, the extreme curve near the mast is at this scale impossible, the spagetti breaks instantly by tensioning it to the required tension. To much loose leech in the top of the sail, whole outline is not good (all these flaws mainly caused by the building method). Tape 3 or 4 spagetti's together to the required mastlength is there. I made it 3 spagetti's at the bottom and it ended to a single spagetti in the tip. Now cut the plastic bag and lay in underneath the mast&batten frame. With some reserve area arounf of 1-2cm. Finally use the marker to make all details on the sail!